DALSA published white paper "The Evolution of CMOS Imaging Technology" talking about its 5T global shutter pixel introduced in 1999. Other global shutter pixel architectures mentioned, dividing them onto "voltage domain" and "charge domain" approaches, whereas "voltage domain" is said to be worse in almost everything, except the "shutter leakage". PR Newswire: Sensors Unlimited, part of Goodrich Corp., has been inducted into the Small Business Innovation Research (SBIR) Hall of Fame. The SBIR Hall of Fame awards are given to firms with a long period of extraordinary success in research, innovation and commercialization. In recognition of this, a member of the Princeton, N.J.-based Sensors Unlimited team accepted an award at the White House executive office building on April 24, 2012. The SBIR funding has helped Sensors Unlimited develop innovative SWIR imager technology for military, industrial and medical applications. China Daily reports that Beijing eedoo Technology Ltd said the company's first multimedia entertainment console is set to hit the Chinese market on April 29, at a price of 3,799 yuan ($600) per unit. eedoo uses SoftKinetic ToF camera to control games in a similar way to Microsoft's Kinect. Good news for SoftKinetic which finally can get big sales after multiple delays! Forward Concepts published its "Cellular Handset and Tablet Chip Markets 2012" research saying that in 2011 market for image sensors in phones and tablets was $2.9B. This compares with $15.9B for baseband chips, $5.5B for power management units, $3.7B for RF transceivers, $3.6B for RF power amplifiers, $2.8B for standalone application processors, and $2.7B for touch-screen controllers. Reuters published an article on digital camera market. "For several years, it has been predicted that smartphone adoption would cut into digital camera sales," said Prashant Malaviya, Associate Professor of Marketing at Georgetown University's McDonough School of Business. "In fact, the exact opposite has happened." "Camera photography is certainly not dead," said Liz Cutting, NPD Group. "We're just seeing a skewing towards what the smartphone can't deliver. People are recognizing that and are going for a higher end camera." Surveys by NPD Group show that while more than a quarter of all American photos were taken by a smartphone, more people were buying cameras with detachable lenses or cameras with optical zooms of 10x or more. In markets such as the US and Japan, says Japan-based IHS analyst Kun Soo Lee, there's not many more people who want to buy compact point-and-shoot camera, a trend which has meant many mobile phones now do a better job of a point-and-shoot camera. How traditional camera makers react to these challenges is unclear. Canon, for example, has no obvious strategy to combat the rise of the smartphone, said IHS's Kun, and so will have to keep on peddling digital cameras. I like this story due to its creativity in solving a complex image processing problem. The aim of the project is to find a way to generate a descriptive metadata about each photo that can be appended to the image on the fly — information about who is in each photo, what they're doing, and their environment. This metadata is quite useful in order to search, filter, and cross-reference our photo collections. "The technology at the core of the Descriptive Camera is Amazon's Mechanical Turk API. It allows a developer to submit Human Intelligence Tasks (HITs) for workers on the internet to complete. The developer sets the guidelines for each task and designs the interface for the worker to submit their results. The developer also sets the price they're willing to pay for the successful completion of each task. An approval and reputation system ensures that workers are incented to deliver acceptable results." "After the shutter button is pressed, the photo is sent to Mechanical Turk for processing and the camera waits for the results. A yellow LED indicates that the results are still "developing" in a nod to film-based photo technology. With a HIT price of $1.25, results are returned typically within 6 minutes and sometimes as fast as 3 minutes." Few examples of the descriptions are given on the project's page. 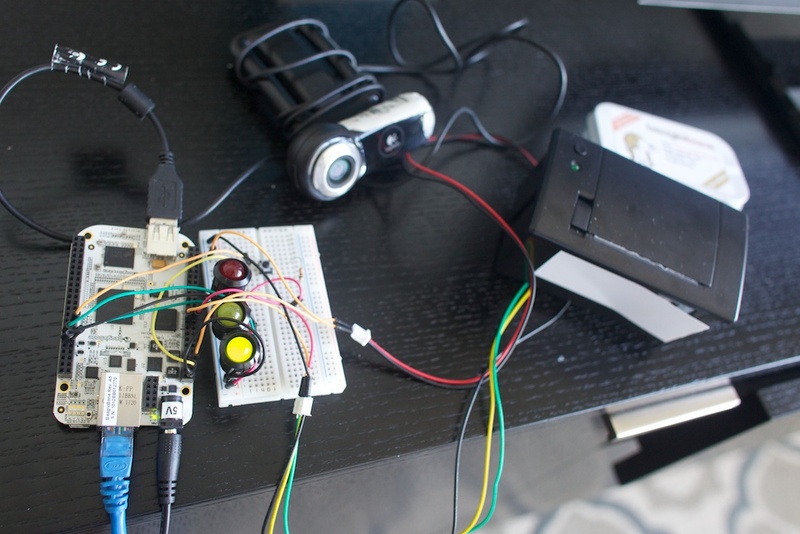 The Descriptive Camera was created by Matt Richardson for Dan O'Sullivan's Spring 2012 Computational Cameras class at New York University's Interactive Telecommunications Program (NYU ITP). More info: BBC, Discovery, Betabeat, NYT. Photonics-online: Sofradir demonstrates a prototype of the first 10-micron pixel pitch HgCdTe-based MWIR imager at SPIE DSS in Baltimore, April 23-27, 2012. Assuming the imager covers 3-5um band, the pixel size is just twice the wavelength, similar to 1.4um visible pixels for 0.4-0.7um band. 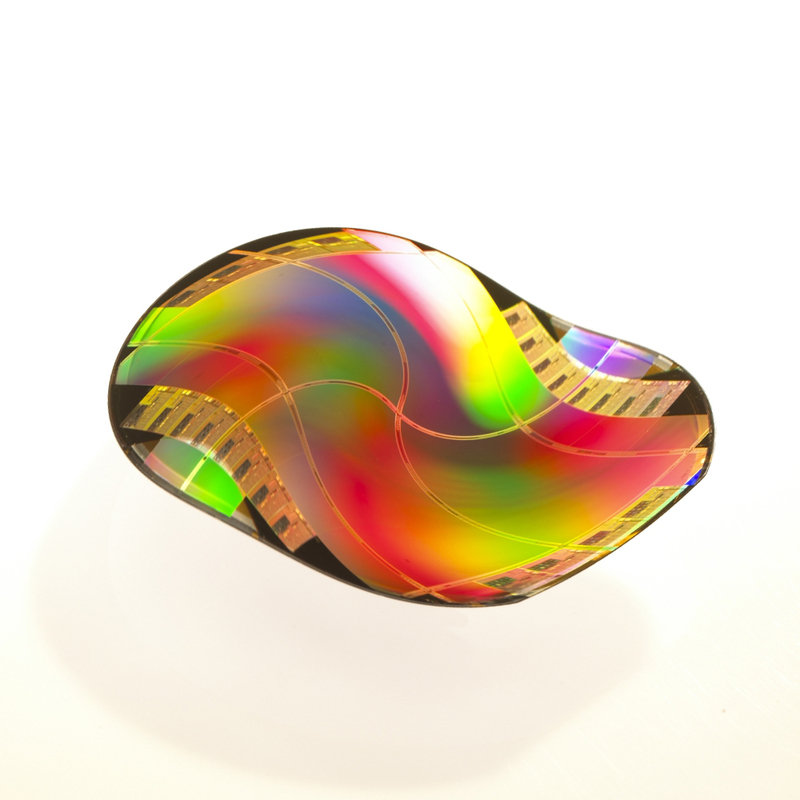 The focal plane array prototype was developed with the support of DGA (Direction Générale de l’Armement) by CEA-Leti at DEFIR, the joint laboratory of Sofradir and CEA-Leti. CEA-Leti is a leading European microtechnology, IT and health technology research center. "It is critical for the military to see first and see the right target, whatever the weather conditions. This is what the higher resolution, higher range 10-micron pixel pitch infrared detector helps provide," said Philippe Bensussan, chairman and CEO at Sofradir. "Sofradir continues to build on its legacy of innovation. We were the first to introduce the 15-micron pixel pitch TV format IR detector, a compact high-resolution product that brought system integrators significant advantages in performance and footprint and has become an industry standard. We’re taking the lead once again by pushing the bar from 12-micron pixel pitch that exists today to 10-micron. Our customers can look forward to the ultimate performance in IR systems." There are few other similar ideas, like pre-charging the large C1i capacitor through a unity-gain buffer and then completing the final charge stage directly from column. One can add a little bit high pass filtering in the buffer to compensate for low-pass nature of the pixel+column cap path. On the other hand, in Kawahito's idea one can add a small time delay or a phase shift in the trans-impedance amplifier 25 on the figure above to achieve a kind of inductive impedance in the column load and get some speed up from it. An integrated phase-coherent and pixel-scalable pulsed-radar transceiver with on-chip tapered loop antennas generates programmable pulses down to 36ps using an integrated 94GHz carrier, frequency synthesized and locked to an external reference. A DLL controls the TX pulse position with 2.28ps resolution, which allows the chip to function as a unit element in a timed-array. The receiver also features a >1.5THz GBW DA as the front-end amplifier, wideband quadrature mixers, and a 26GHz quadrature baseband. Phase coherency allows for ~375μm single-target position resolution by interferometry. A UWB impulse radio (IR) timed-array radar using time-shifted direct-sampling architecture is presented. The transmitter array can generate and send a variety of 10GS/s pulses towards targets. The receiver array samples the reflected signal in RF domain directly by time interleaved sampling with equivalent sampling rate of 20 GS/s. The radar system can determine time of arrival (TOA) and direction of arrival (DOA) through time-shifted sampling edges which are generated by on-chip digital-to-time converters (DTC). The proposed architecture has range and azimuth resolution of 0.75 cm and 3 degree respectively. This prototype is implemented in a 0.18μm CMOS technology. A new readout IC (ROIC) with a 2 step A/D conversion for cooled infrared image sensors is presented in this paper. The sensor operates at a 50Hz frame rate in an Integrate-While-Read snapshot mode. The 16 bit ADC resolution preserves the excellent detector SNR at full well (~3Ge-). 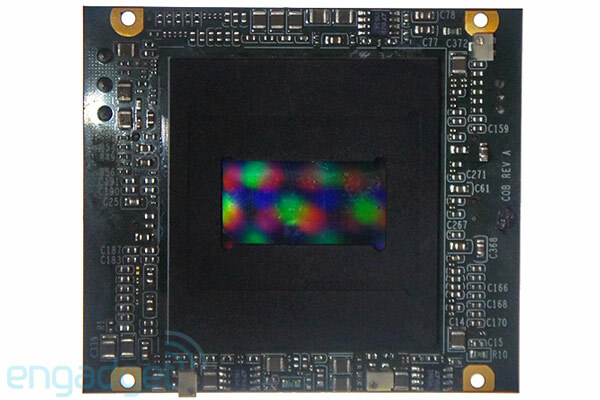 The ROIC, featuring a 320x256 array with 30µm pixel pitch, has been designed in a standard 0.18µm CMOS technology. The IC has been hybridized (indium bump bonding) to a LWIR (Long Wave Infra Red) detector fabricated using our in-house HgCdTe process. The first measurement results of the detector assembly validate both the 2-step ADC concept and its circuit implementation. This work sets a new state-of-the-art SNR of 88dB. PR Newswire: TowerJazz announces the completion of the CIS process transfer from its Migdal Haemek, Israel facility to its US fab in Newport Beach, California providing multi-sourcing to better address its customers' growing needs. TowerJazz's CIS process has already been running in high volume in its Israeli plants, and is now available in its Newport Beach, CA facility for customers that require on-shore manufacturing. Integration of TowerJazz's NMOS pixel with its 0.18um process provides a US-based solution for specialty image sensors for aerospace and defense applications as well. "Our aerospace and defense business is experiencing solid growth and the further expansion of our technology offerings will provide an even broader range of advanced technology to our customer base here in the US," said Corey Fukushima, TowerJazz Aerospace and Defense Sales. "We are providing a high level of support to customize pixels in order to optimize performance for specialty applications, including non-ITAR aerospace and military applications. We are pleased with the transfer of our CIS process to our US fab to address customers' needs for on-shore manufacturing of ITAR applications and to provide a global sourcing solution with our advanced and proven CIS technology offering," said Dr. Avi Strum, VP and GM of Specialty Business Unit. As soon as ISSCC 2012 papers have been published on IEEE site, newspapers get excited about THz imagers presented there. PopSci, Engadget and many others talk about work by Kenneth O, professor of EE at UT Dallas and director of the Texas Analog Center of Excellence(TxACE) at University of Texas at Dallas. "We’ve created approaches that open a previously untapped portion of the electromagnetic spectrum for consumer use and life-saving medical applications," said Dr. Kenneth O. "CMOS is affordable and can be used to make lots of chips," Dr. O said. "The combination of CMOS and terahertz means you could put this chip and receiver on the back of a cellphone, turning it into a device carried in your pocket that can see through objects." Due to privacy concerns, Dr. O and his team are focused on uses in the distance range of less than four inches. 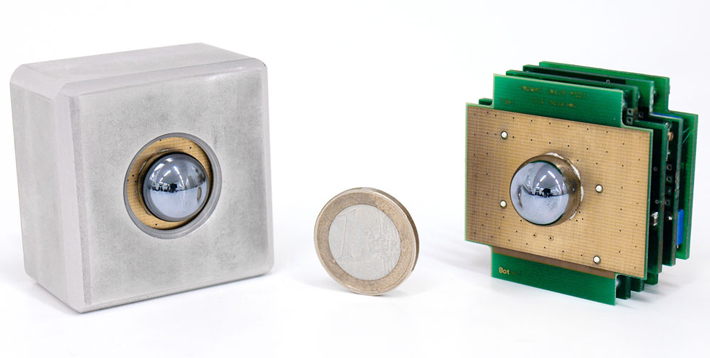 Meanwhile IEEE Spectrum talks about the THz camera designed by a team from IEMN and STMicroelectronics, in France, and the University of Wuppertal, in Germany.This camera has a resolution of 1024 pixels, frame rate 25fps and can operate out of USB power. Photonis announces Lynx CMOS sensor, a 9.7um pixel, 1.3MP low-light image sensor designed man-portable systems and unmanned remote posts where 24/7 CCTV image availability is required. The Lynx read noise is said to be below 4e- at rates up to its full 100 fps with a power consumption under 200mW. The full well is >25Ke- with image lage <0.1%. The output resolution is said to be 10b at 60fps and "digital output" at 100fps. Goossen Boers, CEO of PHOTONIS, commented, "The ground-breaking Lynx CMOS digital sensor is a pure product of our Night Vision expertise. It differentiates itself from other sensors in the market by the perfect combination of large pixels collecting the maximum amount of photons, low noise, low power consumption, very high sensitivity and extended wavelength range. The new sensor reinforces our continued commitment to the low light imaging market as well as to our innovation and new product development." "...a disadvantage of [BSI] sensors is that they are particularly prone to color mixing phenomena between neighboring color filters. In particular, a light ray may cross two adjacent filters 15 of different colors before reaching a photosensitive area 9. A light ray may also be essentially filtered by a filter 15 of a first color, and reach the photosensitive area 9 of a neighboring pixel, associated with another color. Such phenomena are currently called “optical crosstalk” and adversely affect the quality of the images acquired by the sensor. They especially occur when light rays reach filters 15 with poorly adapted angles of incidence, for example, in case of a poor alignment of microlenses 17, or in case of parasitic reflections in the sensor. Such phenomena are particularly strong in the peripheral regions of the sensor, in which the pixels are illuminated by light rays having relatively high angles of incidence, which may exceed 30°." "Walls 23 enable to prevent any direct passing of light between adjacent filtering elements. Walls 23 extend approximately along the entire height, for example, along at least 90% of the height of the filtering layer, and are preferably made of aluminum, of tungsten." Imec: "The main goal of [EuroCIS] project is the creation of a European supply chain for state-of-the art CMOS imagers. As identified by both ESA and the EC, there is a need for such a supply chain for CMOS imagers for space applications which uses solely European (and hence ITAR-free) sources. This goal will be realized using the proposed consortium as all partners have excellent know-how and track record in the expertise fields required." The EuroCIS program has started in Nov. 2011 with a budget of 2,840M 2.84M euro, and is scheduled for 36 months. The program members are Imec (Belgium, sensor design), Selex Galileo (Italy, definition and characterization), Exico (France, BSI laser annealing), TNO (Holland, optical film coating). Tech-On: Sharp announces what its calls the highest resolution 1/2.3-inch CCD featuring 20.15MP resolution and 1.2um pixel pitch. The new RJ23G3BA0LT packs 20% more pixels than the previous generation 16MP CCD in the same optical format and it targets DSC market. The reported sensitivity in Green is 105mV (typ), measured at 1000 lux with F4, 90% transmitting lens at 1/30s exposure. The sensitivity is said to be improved by unique technology using light focusing. The saturation level is 400mV (min). Smear is -86dB (typ). The sensor supports 720p30 video mode. The CCD is sampling starting from April 26, 2012. Mass production will start in August 2012 at a rate of 200,000 units per month. The sensor's speed is 85fps at full 6K resolution, or 120fps at 5K resolution. The new sensor features 5um pixels and 30 mm x 15.8 mm optical array size. Red says that the native DR of Dragon sensor is greater than 15 stops. Business Wire: Aptina installs an integrated yield management system, delivered through Syntricity’s Software-as-a-Service (SaaS) offering, dataConductor.com. Accessed through a web browser, dataConductor provides a reliable, secure, and scalable enterprise yield management system, with automated connections to Aptina’s global supply chain of wafer foundries, assembly houses, and test facilities. "After evaluating yield management system solutions, Syntricity’s dataConductor stood out for its scalability and advanced analysis capabilities," said Ed Jenkins, Director of Product and Test Engineering at Aptina. "Continuously looking to improve our systems, we looked to Syntricity’s success in managing large, hosted data warehouses as a key factor in our decision to partner with them. Syntricity’s hosted database and dataConductor.com tool set will give us ready worldwide access to our supplier data without adding further capital and resources to our current internal IT infrastructure." Panasonic published Digital Camera System Solution Guide 2012 describing its products for digital still camera applications. The 17.78MP 2.8um-pixel MN34070 sensor is said to feature "Micromachined cell technology" delivering "high resolution performance". I'm not sure what the micro-machining means , especially since Chipworks reverse engineering report does not mention anything unusual about its pixel structure. Panasonic Semiconductor Selection Guide 2012 shows a next generation of 1/2.33-inch 1.43um-pixel MN34110 sensor, the MN34120, featuring 1.335um pixels. The new sensor is marked as "under development", no parameters are shown. Samsung published YSNR10 data for its 1.4um-generation BSI sensors. 8MP S5K3H7 YSNR10 is stated at 82 lux. The smaller HD video S5K8AA sensor based on the same pixels shows YSNR of 86 lux. "Sony is reinforcing its development of image sensors, signal processing technologies, lenses and other key digital imaging technologies in which it excels, and plans to leverage these technologies in both its consumer products (such as compact digital still cameras, digital video cameras and interchangeable lens digital cameras) and broadcast and professional products (such as professional use cameras and security cameras) in order to further strengthen and differentiate Sony' overall product line. The Company also plans to extend the use of these key technologies across a wide range of business applications, from security to medical, to further expand the scope of its digital imaging business. Sony will target total sales of 1.5 trillion yen and double-digit operating income margin from the consumer, professional and image sensor businesses by FY14." "Sony is also drawing on its comprehensive strengths in audio and visual technologies to aggressively promote the growth of "4K" technology, which delivers more than four times the resolution of Full HD. Incorporation of Sony-developed technologies, such as image sensors, image processing compression LSIs and high-speed optical transmission modules into its professional-use and high-end consumer products will pave the way for Sony to continue to expand and enrich its 4K-compatible product lineup." Sionyx SEC filing announces a new $16M investment round of which $6,882,639 has already been raised. The investor has not been named. The non-integer amount suggests that it might have been converted from some foreign currency. Albert Theuwissen published another post in "How to Measure" series. It talks about PRNU. Business Wire: ON Semi announces that the European Space Agency (ESA) has awarded it a joint development contract for the next generation star tracker CMOS Sensor HAS3. Once developed and qualified, the High Accuracy Star Tracker 3 (HAS3) image sensor will expand the STAR family of radiation-tolerant CIS. The existing HAS2 CIS offered today by ON Semiconductor is designed for Attitude and Orbit Control (AOCS) space applications. HAS2 has an array of 1024 x 1024 18um pixels and supports non-destructive readout and multiple windowing. Following its qualification in 2007, HAS2 has become the heart of ESA Star Trackers. The HAS3 will be a 1280 x 1280 pixel, radiation tolerant CMOS sensor that features low read noise, 11 x 11 µm2 pixels having 14 bit performance. The HAS3 sensor will support multiple windowing, will be made available in a fully hermetic sealed package and has the option for backside illumination. Applications for the HAS3 device will include star trackers, sun sensors and other scientific applications. In July 2011, Plessey, the silicon supplier producing the HAS2 wafers for ON Semi announced that they would be discontinuing manufacture of this product. ON Semiconductor has secured the product inventory to supply this product to customers to service their predicted full lifetime needs. The company has been working with the ESA to assure HAS2 availability for the years to come. After this period, it is expected that the next generation HAS3. Authors: Ignjatovic, Z. (Electr. & Comput. Eng. Dept., Univ. of Rochester, Rochester, NY, USA), Maricic, D. ; Bocko, M.F. "We present a theoretical analysis, design, and experimental characterization of a CMOS image sensor with pixel-level ΣΔ oversampling analog-to-digital conversion (ADC). The design employs five transistors per-pixel to implement a charge-based ΣΔ ADC at each pixel. In the current design a dynamic regenerative latch comparator is divided into an input transistor, which is contained within each pixel, and the remaining comparator structure shared among the pixels of each column. A charge feedback digital-to-analog converter (DAC) is implemented at each pixel with a three-transistor structure. As opposed to more traditional CMOS image sensors, this image sensor architecture is suitable for implementations in advanced low supply voltage CMOS technologies since its dynamic range is not affected by the reduction of the pixel reset voltage. In addition, similar to the readout methods in low power random access memory designs, this pixel readout architecture does not employ any active amplifiers which allows for low static power operation. Experimental characterization of a prototype fabricated in a 0.35 μm silicided CMOS technology is presented. The estimated power consumption of the fully integrated 128 × 128 imager including decimation filters and I/O interface is 60 nW/pixel at 30 frames per second for 8-bits per-pixel. A peak signal-to-noise ratio of 52 dB and intra-scene dynamic range of 74 dB were measured. The dynamic range was extended to 91 dB through control of the in-pixel DAC supply voltage over the range of 0.8 V-3.3 V."
Second, University of Rochester published Danijel Maričić PhD Thesis describing the techology in even more details: "Image Sensors Employing Oversampling Sigma-Delta Analog-to-Digital Conversion with High Dynamic Range and Low Power". "Every frame scan generates one-bit per-pixel and the readout is repeated OSR times. The image is reconstructed by a digital decimation circuit synchronized with the readout. The comparator is designed for a sampling rate of #rows*max(OSR)*fps = 128*256*60 = 1.97MHz in order to achieve 60 full resolution frames per second following decimation." applicable, special arrangements have been made with existing customers to minimize the impact of this transition. In parallel, I want to assure you that ON Semiconductor has secured ample product inventory to supply this product to customers to service their predicted full lifetime needs with margin." Cornell University Chronicle: Alyosha Molnar, assistant professor of electrical and computer engineering, and his group are building light field image sensors that give readouts of the incident angle of light as it strikes the sensor. The result could be the next generation of 3-D cameras, as well as the ability to focus photos after they're taken, similar to Lytro. This work appears to be a continuation of one presented at ISSCC 2011 (See: A. Wang, P. Gill, and A. Molnar, " An Angle-Sensitive CMOS Imager for Single-Sensor 3D Photography", also in Jan., 2012 issue of JSSC). "If I want to find something in 3-D space, if I just measure the amount of light hitting different locations, I know a little bit. I'll get some sort of blurry blob," Molnar said. "But if I know the incident angle of the light, I can triangulate back. So the question is how do you measure that?" The sensors have resolution of 150K pixels, but the increased resolution is promised. The latest sensors are implemented in 130nm 8M+1P CMOS process. Teledyne DALSA announces it's in the design phase of a revolutionary, next generation image sensor to address a multitude of markets and benefit machine vision system designers from the factory floor to large scale OEMs. Expectations are that this latest chip will fully eclipse today’s technology for general machine vision — especially for food and environmental inspection. The chip will be available in 3 resolutions, 1, 4 and 12 Megapixels with two primary pixel sizes – 5 and 25 µm. Starting with the base pixel, the sensor field-of-view can be adjusted to meet most requirements, covering a range of 5 –100µm pixel pitch. As a result of the properties of the silicone, pixel size can be finely tuned by camera or module design, and based on the theoretical properties of the underlying technology we estimate pixel size could vary from 1 to 10x base. In addition, with the current state of the art we are expecting to demonstrate a 1-4x expansion ratio. Korea IT Times: It appears that Pixelplus managed to survive the difficult times and now reports improvement in its revenues and profits. The company announced its 2011 revenue of 44.7 billion won, a 77% increase over 2010 and the highest number in its whole history. The net profits of 10.8 billion won were reported. In the past Pixelplus struggled with the release of new products, underestimated the Chinese market and was sued on patent infringement by few other companies. "The sensational popularity of the new product in the market paved the road for the company to get back on its feet." All the troubles have been left in the past. The company won all the seven patent lawsuits. In 2007 Pixelplus developed image sensor with integrated ISP for CCTV market. In 2008 Pixelplus started selling the new imagers in China. The company successfully returned to surplus in 2009. The sales revenue reversed the downward trend, growing from 17.5 billion won in 2009 to 25.3 billion won in 2010, then to 44.7 billion won in 2011, all this after sliding down from 38.9 billion won in 2005 to 26.6 billion won in 2006, 17.3 billion won in 2007, and 16.2 billion won in 2008. "No one disputed that Pixelplus, a South Korean developer of CMOS image sensors for various consumer electronics applications, was breathing its last. However, the company has defeated all difficulties, and is now preparing to make a new legend."